Dr. Omar Abu-Bakr is a Specialist Venous Surgeon and Phlebologist, with a special interest in walk-in, walk-out surgery for varicose veins, with an experience of over 10 years in this field. He is a member of The American College of Phlebology, fellow of The College of Phlebology – UK, member of The International Union of Phlebology and member of The European Venous Forum. 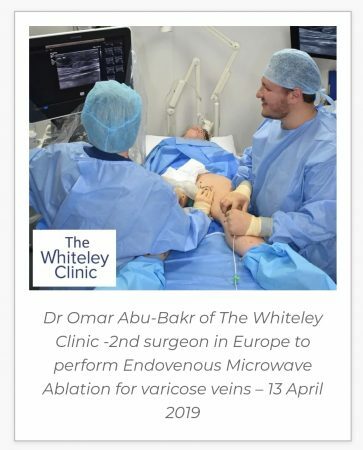 Omar Abu-Bakr successfully completed The Whiteley Clinic courses and training in Endovenous Ablation of Varicose Veins and Thread-Veins (spider veins) Treatment in 2012. He has successfully completed the course and training in Glue Closure therapy of varicose veins held by Sapheon in Germany. He has maintained a keen interest in the treatment of venous diseases throughout his career and has enthusiastically adopted The Whiteley Protocol® for the treatment of varicose veins. Dr. Omar Abu-Bakr is a proud father of a boy and three girls and enjoys spending time with his family.